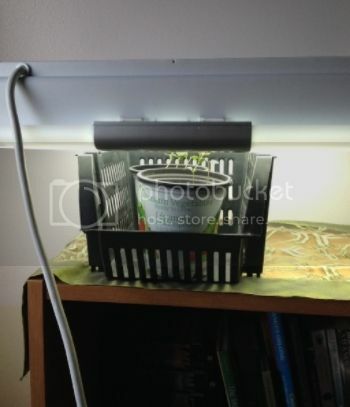 I don't want to invest in a complex lighting system, since I really don't have the time/inclination to have a huge seed starting project, but I've come up with a good plant light that I already had kicking around the house: my SAD light! I've struggled with bad SAD since I was a teenager. I got a Verilux HappyLite for Christmas about a decade ago. I use it religiously every winter, and now my seedlings are going to use it, too. Last year, I had lent it out to a relative and I was stuck with some crappy fluorescent lights for seed starting - an 8 W, and a 13 W. The HappyLite is 36 W. I'm spending a hair more on electricity, but hopefully it pays off.